The Netherlands, a mere 10 years behind the UK, seems eager to catch up. Twin pressures of authoritarianism from above and neoliberalism from below make it necessary to develop the democratic alternative put forward by the movement for a new university. Maagdenhuis occupation, Amsterdam, February 27,2015. Guido van Nispen/Flickr. Some rights reserved.It has been two weeks since the first occupation of the Bungehuis, one of the main buildings of the University of Amsterdam (UvA). 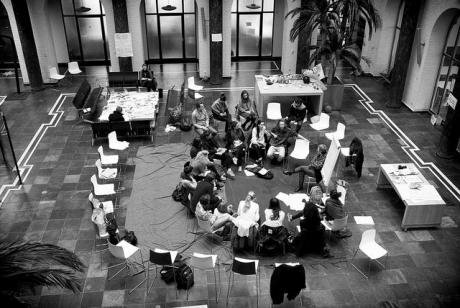 The more recent occupation of UvA’s Senate House – the Maagdenhuis which was famously occupied back in 1969 – and the breadth of the grassroots movement for a New University exposes the problems of Dutch higher education. Increasing student/staff ratios, chronic underfunding, creeping micromanagement of research and teaching, and growing authoritarianism from university management are all conspiring to turn universities into a bureaucratic version of Walmart. The twin pressures of authoritarianism from above and neoliberalism from below make it necessary to develop the democratic alternative put forward by the movement for a new university. The history of the Dutch university since the 1990s is the history of a market-inspired--or market-mimicking--authoritarianism. By the late 1970s most Dutch universities were committed to openness, democracy and equality for all their members. The university’s main constituency has always consisted of students, teachers, and staff. The descent down the authoritarian rabbit hole began with a set of structural and ideological commitments induced by unyielding government pressure in the mid-1990s. Around that time, university bureaucracies and top management came to gradually substitute themselves for the university’s demos under the guise of ‘indirect representation’. At the same time, students were insidiously being transformed into consumers--with some needs attended to by the bureaucracy without any corresponding political empowerment--through the twin process of inter-university competition and the widespread introduction of market-inspired benchmarks. This is what Stefan Collini, one of the most influential British critics of the privatization of higher education, calls ‘the paraphernalia of market simulation’. The upshot is the bureaucratic equivalent of a sausage-factory: the production of the knowledge-sausage at minimum cost for the maximum number of consumers. The process by which one arrives at knowing thus becomes insignificant and secondary: means (degrees) and ends (the free pursuit of knowledge) are completely inverted. It is typically university managers, indeed, in their ivory tower, who bafflingly claim that this leaves the university’s ‘product’ unaffected. Photo supplied by Nicholas Vrousalis. All rights reserved.For all these reasons, Dutch universities today find themselves at a crossroads. They must perforce choose between further privatization and democracy. The first route leads to a degradation of university education in general, and an evisceration of the humanities in particular. The second route leads to a more egalitarian and more efficient public university. Those who question the starkness of this dilemma should think again, especially in light of recent British experience. The structural similarities are striking: in 1999 the Labour government of Tony Blair introduced tuition for university education, at the moderate level of £1000 (c. €1300). Within little more than a decade, undergraduate tuition in the UK had exploded to nine times its original level (c. €11000). This is privatization in all but name. At the same time, Blair installed broader structures of microbullying within universities, ostensibly for the purpose of assessment and quality control of teaching and research. This included bibliometry (citation counts of published work), numerical benchmarks for teaching on the basis of teaching evaluations, numerical targets for the number of publications per year, etc. The Netherlands is a mere ten years behind the UK, but seems eager to catch up. Most Dutch universities already utilize some of these benchmarks for self-assessment purposes, largely for the purpose of disciplining sub-units like departments and their staff, but also in order to make tenure and promotion decisions. It is well-known that these modes of assessment are flawed: it is a category mistake to believe that the quality of academic work can be measured like beans in the sack. It can be evaluated. This is what widely-accepted practices of peer review, that is, the direct assessment of the quality of one’s research, are there for. But no amount of quantitative indexing can substitute for peer review. No amount of citations---or indeed of successful grant applications---will be able to replace substantial assessment of the claims and arguments made in academic work. Inversely, no lack of citations can undermine the main tenets of Darwin’s theory of natural selection or Wittgenstein’s philosophy of language. Indeed, if Darwin and Wittgenstein were academics in the Netherlands today, they would be unlikely to get tenure (Head of department: ‘Mr. Wittgenstein, you’ve only published one book in 20 years, cited by a mere spattering of people in Vienna! Tenure application refused!’). The movement for a New University contests this incessant drive to turn universities into supermarkets, with an unelected – and unaccountable – board of directors at the top, and a hapless army of consumers at the bottom. 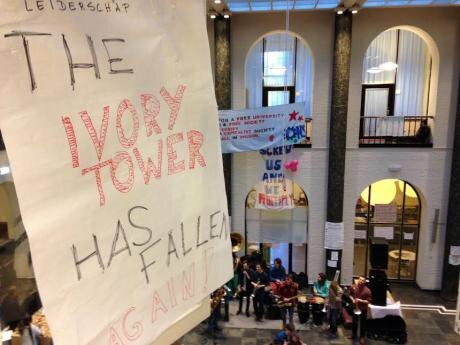 The students and teachers making up this movement are opposed to the opacity and authoritarianism at the helm of Dutch universities, to the hierarchies that the drive to privatization inevitably creates, and to the recent cuts in the humanities that threaten to destroy institutional structures of research and teaching that it took decades to create. It will also be extremely difficult, if at all possible, to recreate even a semblance of democracy were proposed reforms to go through. These are all symptoms of the structure and direction given to the Dutch university since the 1990s. This is why demands for fully elected and accountable university boards, for a roll-back of cuts in the humanities, for a cancellation of the infamous Profiel 2016--a proposal that jeopardizes the jobs of dozens of teachers in the humanities and merges a number of subjects and disciplines in a way that is not driven by informed decisions but by ad-hoc attempts to save money--form the core of any reasonable set of transitional demands for a democratic university. Thanks to the students and their protests we are now in a political moment where these questions are on the public agenda, where what seemed utopian and unrealistic two weeks ago has become a real possibility.